Aruba, fanned by cool trade winds, is an idyll that lies safely below the hurricane belt. Its climate is tropical, but not extreme. Temperatures in the 80s are usually the norm, with plenty of sunshine. The island typically gets only 18 inches of rainfall a year and that is mainly in short downpours during the months of October through January – so the good news is that you can pack light when it comes to rain gear. Aruba is the “A: of the ABC Islands that are constituent countries under the Kingdom of the Netherlands (the “B” is Bonaire and the “C” is Curacao) and it is one of my favorite Caribbean islands to visit. 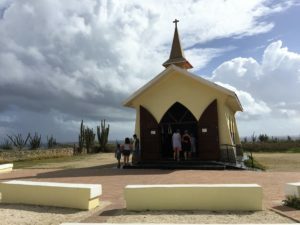 1) Alto Vista Chapel, a small yellow structure that was built in 1952 on the site of the original chapel that dates from the 18th century –it was Aruba’s first Catholic church established by Spanish missionary Domingo Antonio Silvestre. It is pretty and peaceful surrounded by the Aruban countryside dotted by cacti and with views of the sea. 2) The California Lighthouse is a picturesque stone lighthouse from the 1910s. It is named for the S.S. California, a wooden sailing ship that sank off the shore here. Sand dunes in the area are popular for “dune surfing” with the locals – who slide down the dunes in all manner of ways. 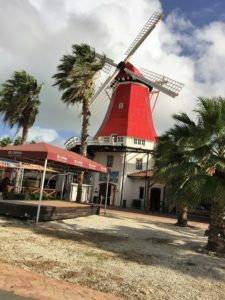 3) De Olde Molen is a windmill constructed in The Netherlands in the 19th century, shipped piece by piece to Oranjestad, the capital of the island, and reconstructed in the 20th century – it has been a restaurant and is now a nightclub. 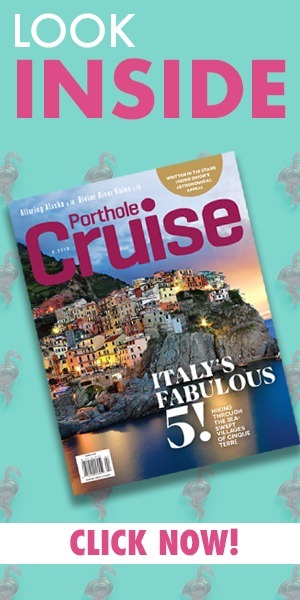 It is a good spot for photos – your relatives and friends will think you were in The Netherlands when they see them. 4) The Baby Bridge, carved by the wind and sea erosion, is a small natural bridge near the ruins of a famous iconic larger bridge that stood 23 feet above the sea and spanned more than 100 feet but sadly collapsed in 2005. 5) The enigmatic Casibari Rock Formations, giant boulders – some weighing a ton and in unusual formations – that appear in the middle of a flat, desert landscape near Hooiberg as if they had been strewn about by a gigantic hand. There are walking trails and steps to explore the formations and reach the top for views of the island. 6) Divi divi trees that are like signposts: always pointing to the west, in the direction of the trade winds that blow from the northeast. 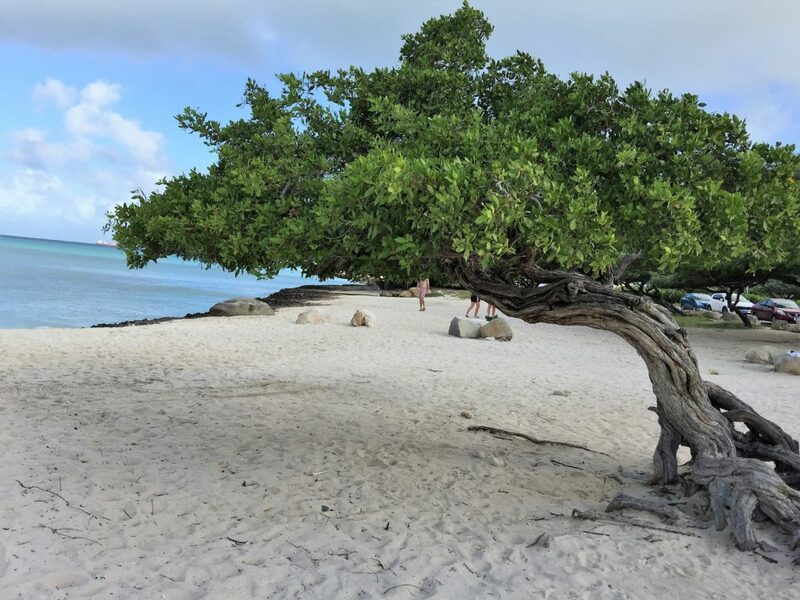 Locals have told us more than once, “it’s impossible to get lost here!” All you need do is look for a divi divi tree and you know which way is west. 7) Palm Beach is a two-mile strip of facial-powder-quality sands and aquamarine waters that often makes the “Top 10 Beaches of the Caribbean” lists. It is dotted with high-rise hotels, restaurants, bars and a variety of water sports concessions. Another idyll to try is Eagle Beach. 8) Shopping is a popular pastime in Aruba and downtown Oranjestad, the capital, has several malls including the Renaissance Mall, Royal Plaza and Renaissance Marketplace as well as lots of shops and boutiques where you can pick up such treats as Dutch chocolates and cheese, Dutch Delft collectibles, Curacao liqueur, jewelry, aloe products and arts and crafts – all great as gifts for the folks back home (if you don’t decide to keep them for yourself! ).